My opponent Eric Rodriguez was 16 years old at the time of this game and yet another super-kid master. With this, I had played eight USCF tournament games since moving to Florida. Four of those games were vs masters who were too young to vote. Add up the ages of my opponents in those games and you equal MY age. I never played competitive chess until I was an adult. I am amazed and impressive to watch these kids perform. FIDE master Eric Oscar Rodriguez has been very successful in his early chess career. In recent events, his USCF rating is sometimes over 2400 and other times just under, currently 2383. Rodriguez has a peak FIDE rating of 2352 and 95 FIDE losses. This means Eric has spent a lot of time playing in events vs higher rated opponents. Most of the time, Eric Rodriguez wins! Against me, Rodriguez played the Lion System which has been very popular since this game. 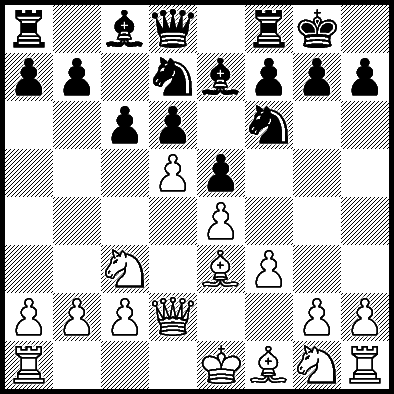 Black basically plays d6, Nf6, Nbd7, e5, c6, Be7, 0-0 and often Qc7 and or h6, depending on what White does. I took an aggressive approach. Alas, I made a serious mistake with 9.Nxd5? for which I was well punished. Instead of winning any material, Eric Rodriguez played for checkmate. I was so disgusted with my play in this game that I quit the tournament and did not play again for eight months. My opening knowledge, tactical skill, analytical ability and strategical approach were all in shambles. I realized that my game needed a major rebuilding at this point. One thing I started doing was a lot more tactical exercises.